From the clear waters and pebbly beaches of the Makarska Riviera, to the backdrop of magnificent Biokovo Mountain, the small town of Makarska is our wonderful setting for a week of walking. 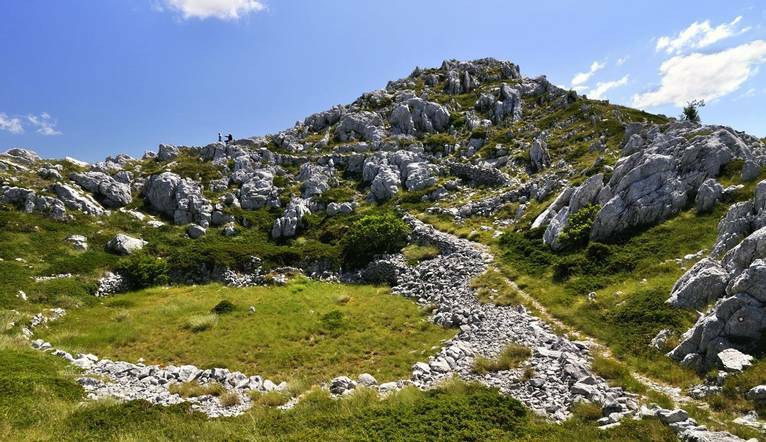 The 4 chosen guided walks are a great introduction to some of the stunning landscapes of Croatia. Following a well-beaten hiking trail on rocky ground and partly through beech forest, the path begins at St. Jure, Biokovo’s highest peak. With amazing views over the whole of Zabiokovlje Sinj to the Vrgorac Central mountains and around to Sarajevo (capital of Bosnia and Herzegovina) we continue on foot to Vosac peak where more stunning views across the whole of Dalmatia await. Lunch is taken in a mountain hut. Our walk today follows good paths, and the odd bit of forest gravel road, from Upper Brela to the Church of St. Nicholas, dating back to the 13th-century. It’s then over to Nevestina Stina for picturesque views of the sandy beaches and villages below with lunch as a picnic en route to Topic, a charming village on the mountain slopes with beautifully preserved Dalmatian architecture. Setting off from the village of Bast, we cross over the Smokvina River admiring the steep cliffs of Mount Biokovo and through the picturesque villages of Mletin Bor, Baskovic, Veliko Brdo and Makar. The whole route affords wonderful views of the entire western part of the Makarska Riviera, the coastal towns of Split and the central islands. A picnic lunch will be taken along the trail. Situated 50m from a pretty pebble beach in the heart of Dalmatia. Ideal for relaxing after our walks, facilities here include a bar/restaurant serving traditional cuisine, wellness centre and WIFI throughout. The comfortable rooms come equipped with air-conditioning, satellite TV, minibar and Wi-Fi. You must ensure that you are fit and well enough to take part in the chosen Walk or Trek according to the different grades. The transfer time from Split Airport to Hotel Bella Vista is approximately 1 hour and 15 minutes , depending on weather and traffic. Four guided walks are included in the programme. Your walking guide will advise you in resort of the daily programme. The walking programme is graded as Easy to Medium and you can expect to walk between 8 to 11km per day, with some ascents/descents, rough underfoot terrain and high altitudes involved. Length approx 9 km Altitude: 300 m ascent, descent 300 m Hiking 4 h. light to moderately heavy terrain. It is your responsibility to ensure that you are fit and well enough to take part in your chosen activity holiday. If you are unsure as to whether the walks are within your capabilities, please contact the office to discuss this matter, thus making sure you appreciate the terrain that you will be walking. You could be walking across uneven ground in some areas and extreme care must be taken, especially if wet. If used to using a pole/stick, it is advisable to bring it. Please appreciate the route and content of the holiday may change at the time and at the discretion of the guide/organiser, should conditions require. Solo’s Holidays Ltd cannot be held responsible for personal injury, accident or damage to property whilst on these walks other than incidents arising out of the company’s negligence. The guide has the right to refuse to guide a walk with anyone not properly attired. It is of paramount importance that you have the correct footwear. It is essential to wear walking boots that are comfortable and preferably lightweight, with some ankle support and a good grip. If you already have a pair of boots that you are happy walking in (including during hot/wet weather and on hard ground), then bring these along. However, if you are bringing new footwear, do make sure they are well broken in before you arrive. Experience has shown that wearing 2 pairs of woollen socks adds to comfort. Good, high factor sunscreen, sunhat and sunglasses – the sun’s strength is often multiplied in mountainous areas. Listed below are a few of the optional tours which may be on offer to you during your holiday. The prices quoted should be used as a guideline only and operation of all excursions is subject to a minimum number of participants. Full details of all the tours available and the exact amounts will be given at your Information Meeting as the prices will be dependant on the number of people wishing to take the trip. Your Tour Leader will book the excursions for you but may not necessarily accompany you. We suggest a Group Collection to cover transfer drivers, and hotel staff of €15.00 per person. Your Tour Leader will collect this on your behalf and distribute it accordingly, thus relieving you of the burden of who, when and how much to tip. The tipping of housekeeping will be left to your individual discretion (a small amount left in your room on departure should cover this and would be much appreciated). As is customary, ‘the hat’ will be passed around for the driver and guide on all optional excursions. For any meals that are not included in your itinerary, or taxi fares, your Tour Leader can advise of an appropriate Ͽo add on.